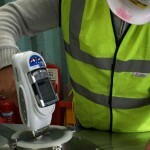 PMI Positive Material Identification : Advanced NDT Solutions personnel have extensive experience in PMI Positive Material Identification. Our experienced Inspection Engineers are certified to ASME and EN non destructive testing codes. 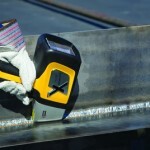 Positive Material Identification is a quick non-intrusive means of identifying the grade of material. PMI uses x-ray diffraction to identify the elements present in a material and the percentage of each element present. This gives a quick and easy analysis of the material grade. So if you are unsure of the material you have in your plant and machinery our inspection engineers can carry out this quick test to identify what you have. The PMI unit is placed in contact with the material to be identified. The x rays are beamed into the material and the analyser in the unit identifies the material. If replacement parts for a machine are required but the material is unknown this quick and non-destructive inspection method is ideal. All components on a piece of equipment can be identified quickly and easily with PMI. 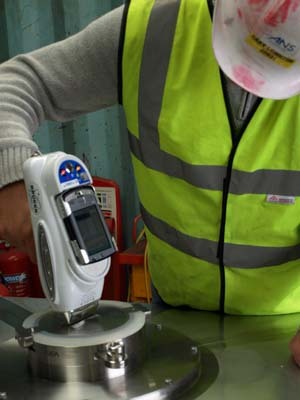 The only requirement is that the item to be identified is clean and free of dirt and grease which will affect the accuracy of the measurement. 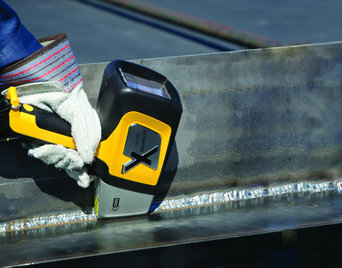 PMI can be used on hot surfaces so plant does not have to be switched off for the analysis to be carried out. This is ideal where items have to be identified prior to a plant shutdown so that replacement materials of the proper grade can be made available.